Lim's Pharmacy has established an outstanding rapport among the multicultural, local and international community, and thanks to the support of our community, we have received many great honours from the public and the media. Check out various articles and videos about Lim's Pharmacy, and the owner Richard here! 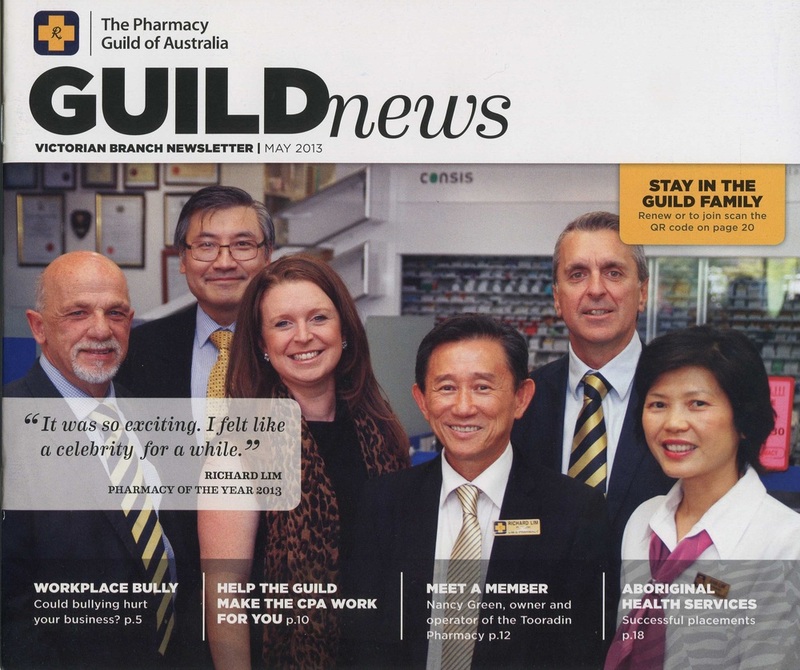 This article from the QCPP is about the winners of of the Pharmacy of the Year award in 2013, featuring Lim's Pharmacy as the overall winners! Read it here. Richard Lim's extraordinary journey is featured in Monash Life Magazine. Richard is an alumni of Monash University's Faculty of Pharmacy and Pharmaceutical Sciences (formerly The Victorian College of Pharmacy), and is a long-time supporter of Monash University. Below is a clear copy of his extraordinary journey, as well as a link to the online version. Special thanks to Barbara Talisman (Senior Manager Philanthropy and Alumni Engagement, Monash University) and Muriel Reddy (Author) for making this possible! Lim's Pharmacy and owner, Richard Lim, was featured in an article titled, 'Iconic Springvale Pharmacy Continues to Serve', in the latest issue of The Stakeholder, a business magazine for the City of Greater Dandenong. The article below describes how "Richard Lim's desire to give back to the community" and "personalised and holistic approach to healthcare sets Lim's Pharmacy apart from its competitors." 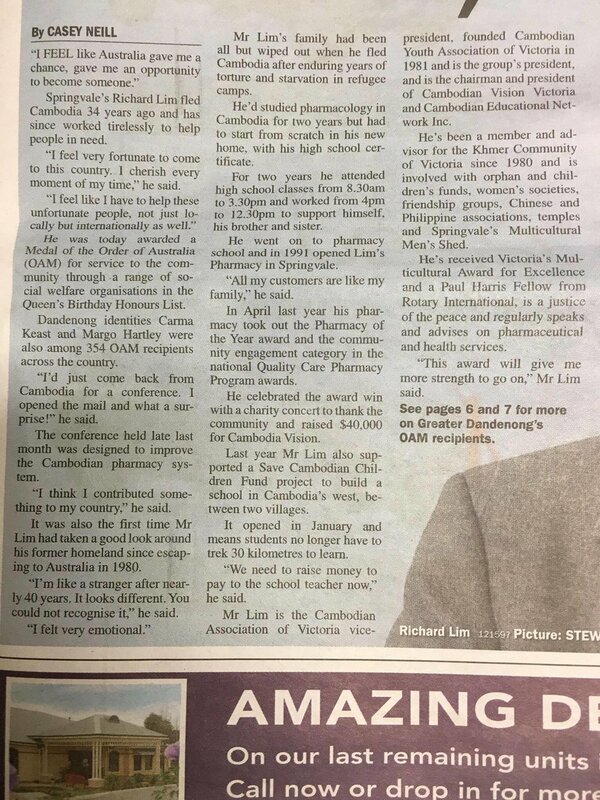 Lim's Pharmacy owner, Richard Lim, was featured on the front cover of the first issue of Cambodia Magazine - a free, local magazine made for the Australian-Cambodian community. 49 parking metres in Springvale were removed by the council after a long battle fought by Richard Lim, Mayor Jim Memeti, Youhorn Chea, Roz Blades, Tim Dark, Maria Samepay, and the members of the community! Featured is Richard Lim OAM JP with Daniel Cheng (President of SABA) on the cover of the Greater Dandenong Leader. Upon receiving the Medal of the Order of Australia (OAM) in 2014, Lim's Pharmacy owner Richard Suor Lim was featured on the front page of the Dandenong Journal in an article titled, 'Thanks, Australia'. The article highlights Richard's efforts to provide the community with quality customer service, as well as his contribution to the betterment of society via his notable and ongoing support of numerous charity funds. Richard Lim attended the Victorian State Budget Breakfast, and is pictured in Guild News at the event alongside Premier of Victoria Daniel Andrews, Mr Allan Crosthwaite (Guild Director), Ms Jill Hennessy (Health Minister), and Tim Pallas (Treasurer). An interview with Richard Lim in Khmer that discusses the importance of free eye care to Cambodian people provided by Cambodia Vision, and his experiences on his first mission in 2017. Richard Lim speaks in Khmer about the rescheduling of medicines containing codeine, such as certain analgesics and cold-and-flu preparations, from over-the-counter (S2) and pharmacist-only medicines (S3), to prescription-only medicines (S4), in February 2018. Upon Lim's Pharmacy's victory as QCPP Pharmacy of the Year 2013, owner Richard Lim OAM JP was interviewed by Meng Heang Tak on SBS radio. Due to the pharmacy's extensive contribution to the community, the president of the Cambodian Association of Victoria, Cr. Youhorn Chea, featured Lim's Pharmacy owner, Richard Lim OAM JP, in his President's Message. Read it here. In 2013, Lim's Pharmacy raised $40,000 for Cambodia Vision, a non-profit organisation which endeavours to restore the sight of the less fortunate in small provincial towns of Cambodia. Lim's Pharmacy owners, Richard and Ann Lim, were then presented with a copy of a speech made by Clayton MP Hong Lim, about their then recent Pharmacy of the Year victory. Read the full article here. As a result of Lim's Pharmacy and Richard Lim's extensive contributions to the community, Richard Lim was presented with an OAM in 2014. Read the full article here. Lim's Pharmacy has teamed up with SK Media to found SK Health Time, a Facebook page dedicated to making health education videos in English and Khmer, presented by Richard Lim and the staff of Lim's Pharmacy. Like the page here.